A couple days ago I posted a recording called Where The Bears Go by my duo The John Waynes (so named because it consists of John Sobol (me) and Wayne Kelso). 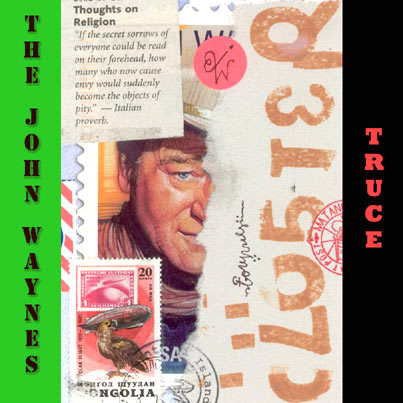 Today I posted a second recording by The John Waynes called The Evil I. For those keeping score, Where The Bears Go is a dreamy delight and The Evil I is a harsh catharsis. I hope you dig them both. The key thing to understand about these recordings is that they are 100% improvised. That the words I am speaking (and Wayne’s amazing piano playing) are being declaimed entirely in the moment, without reference to any paper, script or plan other than the complex interactive sympathy between Wayne’s expressive piano-being and my internal mind, my embodied tongue, and the entire external universe. I call it riffing. It is both very difficult and very easy to do, and I maintain that I can teach almost anyone to do it if they actually want to learn. Riffing is an ancient transformative practice that involves the complete sublimation and submission of the individual ego, combined with total concentration and sensitivity to possibilities. It is akin to prayer, to possession, to sacrifice and to meditation. Rifffing requires a complete commitment to being infiltrated, penetrated and inspired. Its techne involves heightening one’s awareness to the web of relationships we weave between essential unity and incidental difference; riffing requires that one become an ear open to every message and dream, all articulated by the spiritual muscle of the tongue, singing the moment with as few filters as possible, discovering those ecstatic narratives that course unseen through our everyday being like cosmic blood. But what exactly does riffing have to do with our digital future? We live in an age defined by ruptured relationships. OS2 – the literate operating system on which our civilization currently runs – is defined by its monological nature. Literacy does not listen. Books, contracts, deeds, bills, maps, schematics and all the rest of our administrative infrastructure – these are one-way technologies. Paper talks and we listen. But the opposite is not true. Paper has no ears to ear, nor do the administrative systems (law, science, industry, etc.) built upon it. And so our paper systems do not hear the cries of the earth, the dying whispers of species, the gasps of toxic lakes and moans of oceans, choked with refuse and poison. But OS2 is starting to crumble. Because OS3 – the emergent digital Operating System of civilization – is far more efficient than OS2. And the key to OS3’s hyper-efficiency is its ability to listen. Because the web does listen to you. Someone is always ready to respond online. OS3 is always listening, always conversing, always interacting, always actively iterating and relating. For, like OS1 – which was based on the technology of the human voice – OS3 is dialogical. It is a giant ear. And this makes it more efficient than OS2 and printed books. Which do not listen, relate or iterate but are passive, acontextual and static, like curricula in schools or laws that have been ‘on the books’ for decades, like formulae and equations that are eternally fixed. And thus hyper-efficient OS3 is starting to oust OS2 systems and usurp OS2 power. OS3 promotes immediacy over history, experience over artifacts, events over archives, improvisation over reproduction, personalization over standardization, participation over spectating and constantly shifting peer-to-peer relationships over fixed hierarchies. We see it with file-sharing and open-source software, we see it in the rise of the Occupy movement and the Arab Spring, we see it in the collapse of OS2 pedagogies, which are utterly unnerved by OS3 knowledge which is not fixed and not factual but responsive and relational, gaining meaning only when created in the moment through the mutual effort of anybody who wants to play. All of which is why the practice of riffing poetry is so connected with our digital future. We are entering an age in which our entire civilization will be based on dialogical values, knowledge and practices. An era in which digitally-enabled dialogical relationships will rule, not monological paper policies without ears to hear. And it is my belief that the more bridges we can build between our dialogical past (riffing is an OS1 skill after all, very old indeed) and our dialogical future the better off we will all be. if you enjoy the poems and music of The John Waynes, and want to learn how to riff, then let me know. If I get a few genuinely interested requests I will start sharing lessons in Improvised Poetics on this blog, so that they too can become bridges between OS1 and OS3, helping all of us to develop ears to hear and voices to sing those deeper songs of unity we need to sing if we are to overcome literacy’s ecocidal agenda. Meanwhile, I hope you enjoy Where The Bears Go and The Evil I by The John Waynes.